h) In order to be able to successfully pull off the catering job for the wedding and for future jobs, George decides to hire an assistant. He paid the assistant a $4,000 salary. What happens with this? $4,000 cash paid means that our bank account will decrease by $4,000. Bank increases on the debit side (left), and decreases on the credit side (right). So we credit the bank account of the business. The salary paid to the assistant is an expense, and this amounts to $4,000. 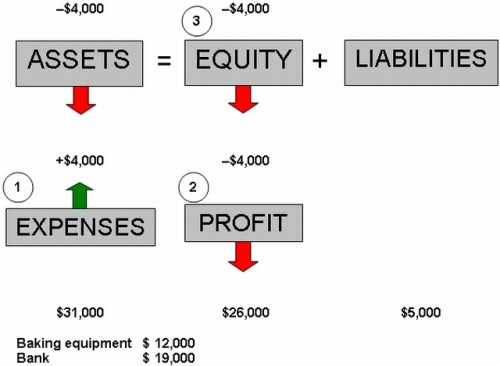 Expenses take place (or increase) on the left, because it is the opposite of income and means less for the owner (owner’s equity). We debit the expense, and we call it salaries. This salaries expense will result in $4,000 less for the owner. If you are having difficulty understanding expenses, go back to our earlier lesson entitled Define Expenses, where we define this accounting concept and look at how it works. Or, if you're struggling with the concept of debits and credits, return our earlier lesson called Debits and Credits: What They Really Mean. Q: What is an example of an expense?